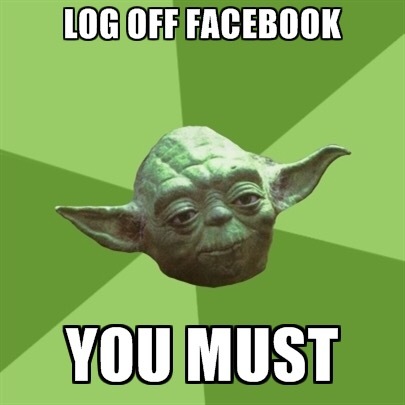 I decided to give up Facebook for Lent this year. It was a particularly difficult decision because my other choice was sweets. The way I’ve been scarfing down chocolate chips whilst hiding in the pantry from my three year old indicates a true need to do something about my lack of coping skills. What was the deciding factor? Toxicity. The book of faces is a nasty place right now. It got worse after the election and I’ll admit to my own lapse in judgement before hitting the post button. I realized after I stepped back and took a deep breath that I had to walk away from Facebook. I was checking in too frequently, this was pulling me away from my family, creating more division with people I love, and it was very difficult to be present when all I could do was think about what to post, who responded/liked/laughed/gave me angry face/etc. It was also a matter of feeling like I needed to be informed, but do I really need to be that informed? I think checking in with the Nightly News is one thing, but when I’m receiving updates every hour or more, I get a little nutty. I can’t sustain that level of awareness and be a pleasant person. From what I’m witnessing, it’s the same for other people, too. At first it was a big adjustment. I never realized how much time and energy I spend coming up with something to say or how much of a compulsion it is to post about the littlest thing. Then there’s the act of asking myself what my motives are in posting or responding. Am I letting off steam? Looking for sympathy? Do people really care that I couldn’t find the applesauce in the grocery aisle I expected it to be in? Probably not. Here I am, 12 days away from Easter and with the exception of posting from my pages app for work and the Grassroots Yarn page; and following some important groups from my groups app, I’ve noticed that my world has been a considerably more peaceful place. I’ve been able to get more accomplished at work, as a parent, and wife. I’ve revived the blog, knitted more, and read more than I have in recent years. As a result I’m more calm and centered. Will I go back? In moderation. I do miss hearing big announcements, keeping up with loved ones, and seeing the beautiful side of Facebook. I found that I get a lot more out of living my life and sticking with my interests. Also, I found renewed joy hanging out on Instagram and Pinterest. There are a lot of beautiful images there. All in all, this was one of the best Lenten journeys I’ve walked. It invoked a great deal of restraint and self reflection–appropriate for this liturgical season.